Join Bamboo Reef each month as we explore scuba dive sites around Monterey Bay, Carmel, and Sonoma. Fun dives are a great way to keep your scuba skills proficient and keep in touch with other divers. 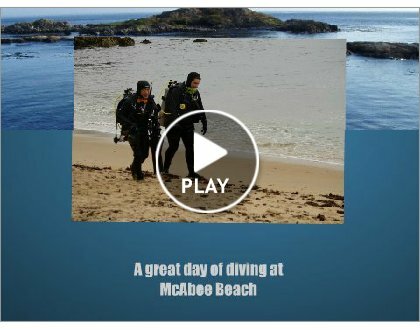 You also have a great way to learn about what Monterey, Carmel, & Sonoma has to offer to scuba divers in the way of marine animals and diving experiences. Each month we select a shore dive site or charter a boat to go to sites unreachable from the shore. Our shore dives include a barbeque and drinks to enjoy as you share you and your buddies exploits with your fellow divers. Boat dives, we get together back on land at a nearby restaurant to talk about the dives. Experienced and knowledgeable diver leaders are present to ensure you have a safe and fun experience. All fun dives are two tank dives. Fun Diver’s must provide their own equipment (available for rent), c-card, and a sense of adventure. See the calendar for scheduled dates and locations. Like us on Facebook to be kept up to date on the details of upcoming Fun Dives. Contact one of our stores for more information. Our professional staff will be happy to assist you and let you know more about our fun dives.